More than one in three persons over age 65 fall each year, often at home. If falls do happen, luckily, most do not result in any injury with the exception of a minor bruise or scraped knee. But falling in the bathroom is an entirely different matter. According to a 2011 study from the Centers for Disease Control and Prevention (CDC), nearly 200,000 Americans are treated in emergency departments for bathroom-related injuries annually. Due to a multitude of reasons, bathrooms are very hazardous. Bathrooms have unforgiving and slippery surfaces, and few dependable things to grasp onto, which greatly increases the chances for harm. Fall-related injuries range from minor cuts, scrapes and bruises to more severe injuries, such as broken bones (especially hip fractures), head contusions, and even spinal cord injury. Are you or a loved one susceptible? Low toilets heights that are difficult to get up from easily. Installing safety features in the bathroom is key to reducing the risk of falling. When renovating a bathroom for an elder’s safety, consider the following options. Poor balance while getting in/out of shower? Install grab bars. Many elders use towel bars or shower/tub features to hold onto while climbing in and out of the shower/tub. Towel bars are good for holding towels but aren’t built to support weight. Instead, install grab bars in easy-to-reach places to help support balance when entering and exiting the shower or tub. 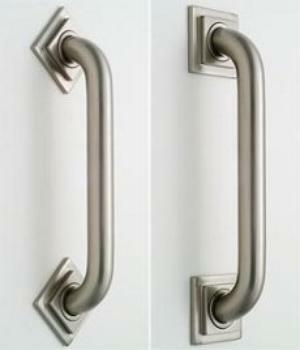 Grab bars are best suited for elders with good upper-body strength who are able to hold onto grab bars while moving or standing. All grab bars should be slip-resistant (‘grip’ surface bars are better than those bars with high gloss finish), color contrasted from the wall for visibility, and securely fixed to the studs of the wall for adequate support ("bolted on" bars are preferable to suction cup bars, which could easily slip away when body weight is applied). Install a tension pole. An alternative to grab bars when getting in and out of a shower or tub is a tension pole from floor to ceiling that gives the elder something to hold on to for balance support. Use a shower chair. 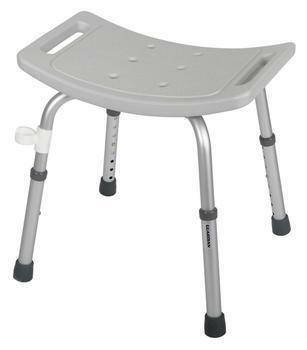 A shower chair can provide stability for an elder with difficulty balancing and a rest place for those who have difficulty standing for long periods of time. A good shower chair has rubber tips on the legs to prevent sliding. When used with a hand-held shower head, an elder can remain seated while bathing. Poor balance and/or difficulty getting in and out of bathtub? Use a tub-attached grab bar. If an elder uses a tub to bathe, they need to step over the tub’s high sides whenever they get in and out. During tub transfers, a grab bar securely mounted on the tub rim can supply balance support. "Clamp on" safety bars are designed for steel bath tubs and can’t be easily tightened onto newer fiberglass or acrylic tubs without cracking the tub. A tension pole can serve as an alternative. Use a bath (transfer) bench. A bath bench eliminates the problem of stepping in/out of the tub. The elder lift their legs over the side of the tub instead. The individual gets in safely by sitting down on the bench outside the tub, then sliding over safely into the tub. The bath bench is often used with a hand-held shower, allowing the elder to remain seated while bathing. Non-slip mats. Falls often occur when elders are getting in and out of the tub or shower. Having a non-slip mat (or decals) on the floor of the shower or tub as well as a non-slip rug on the floor when stepping out of tub or shower (to prevent slipping on wet tiles) helps the elder feel more stable and can reduces slipping. Stepping onto a towel is bad; the towel can easily slide away from underneath the feet. A non-slip rug in front of the toilet and by the sink area can help to reduce slipping on wet tiles. A rubber non-slip mat. A mat or non-slip adhesive strips applied to the bathtub and shower floor surface provides stable footing. Sometimes elders with decreased vision and poor depth perception view bathtub surfaces as "bottomless pits" and become fearful when entering. Placing a mat or strips on the tub/shower floor can eliminate this problem by providing visual cuing. Non-slip adhesive strips. These can be placed on the top of sink edges to guard against hand slippage if these surfaces are used for balance support. Difficulty with rising from or sitting down on toilet? Use a raised toilet seat. Elders may have difficulty lowering themselves down to sit on a low toilet seat and rising to a standing position safely (due to lack of arm and leg strength and balance). A raised toilet seat (raises toilet seat height by 3-4 inches) reduces the amount of squatting and the distance that has to be covered to sit on the toilet. Grab bars on the raised seat itself provide added safety. 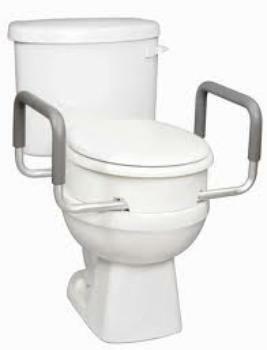 Bedside commodes are beneficial if toilets are difficult for an individual to use. Elders who have a difficult time traveling to the bathroom because of the location of the bathroom also benefit from bedside commodes. Install grab bars. Grab bars (either wall or toilet-attached) can compensate for low toilet seats and help an elder sit down and get up safely. Put toiletries within reach. Elders with poor balance should not have to stretch or bend down for the shampoo bottle or soap. Mount an easy to reach liquid soap dispenser on the bathtub or shower wall to prevent reaching, bending and unsteadiness. Caregiver Assistance. Elders who experience episodes of dizziness when getting up too quickly benefit from someone nearby when bathing. Regular Cleaning. Routinely ridding showers and tubs of soap scum and mildew can reduce the slippery coating that forms as a result of these substances. Also, be sure to avoid clutter in the bathroom to prevent tripping. Telephone. Install a telephone in the bathroom. 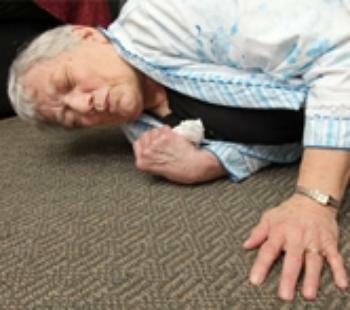 Having a phone nearby in the event of a fall and/or injury ensures that the elder gets help quickly. This may be life-saving for an elder who lives alone. As an alternative, a medical alert system (that’s waterproof) can be used. Bathroom Doors. Does the door swing out or into the bathroom to open? If an elder falls against the door, outward swinging doors will allow caregivers and emergency personnel access in the event of a serious fall. Lighting. Is the pathway from the bedroom to the bathroom dark? A poorly-lit pathway can easily cause a fall. Use nightlights to create a well-lit path to the bathroom. Having nightlights in the bathroom helps as well. Aging: is it all in your head?